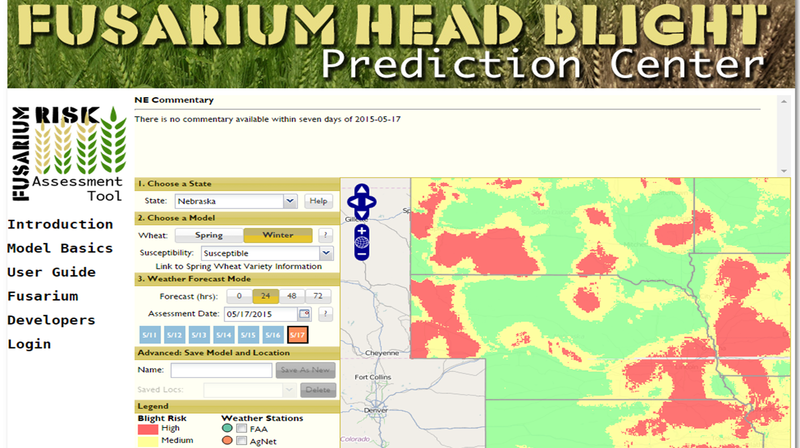 Fusarium Head Blight Risk Assessment Tool: http://www.wheatscab.psu.edu/. With wheat heading/flowering in South Central Nebraska and recent rains, risk for Fusarium Head Blight (scab) in wheat in our area of the state has increased to moderate/high. I’m also finding stripe rust up to a leaf below flag with some just beginning to appear on the flag leaves. This year creates a harder decision for applying fungicides in non-irrigated fields with cost of production, wheat price, poor stands, and severe stripe rust. If you are considering a fungicide, your options during flowering are: Prosaro, Caramba, and Proline. Typical foliar fungicides are off-label once flowering occurs. The above-mentioned fungicides can help prevent scab and control stripe rust and some other foliar fungal diseases if the fungicide is timed correctly. For preventing scab, research has shown that fungicides applied when approximately 30% of wheat heads reach beginning flower stage do a good job of protecting wheat plants as did the application of fungicide within 5 days of early flowering. Application of the fungicide 7-10 days after flowering offered minimal control based on University research trials sponsored by the U.S. Wheat and Barley Scab Initiative. Nebraska Extension Foliar fungicide table. UNL CropWatch Wheat Disease Article. U.S. Wheat and Barley Scab Initiative. Posted on May 17, 2015, in Crop Updates and tagged farm, farming, Fusarium Head Blight, Nebraska, wheat, wheat fungicides, wheat fungus, Wheat Scab. Bookmark the permalink. Leave a comment.